Little Richard has the utmost respect for singer CeeLo Green, but when it comes to "The Voice" there's another judge he has high praise for. "I tell you 'The Voice' did a lot for Blake [Shelton]," the rock and roll icon told Green. "He does a really good job on 'The Voice.'" The remarks came recently during "The Legacy Lounge," a presentation of The Recording Academy's Atlanta chapter where a contemporary artist interviews one of their musical inspirations. Green admitted to being a total fan of the 80-year-old "Good Golly Miss Molly" singer, who revealed that he almost didn't make the event. 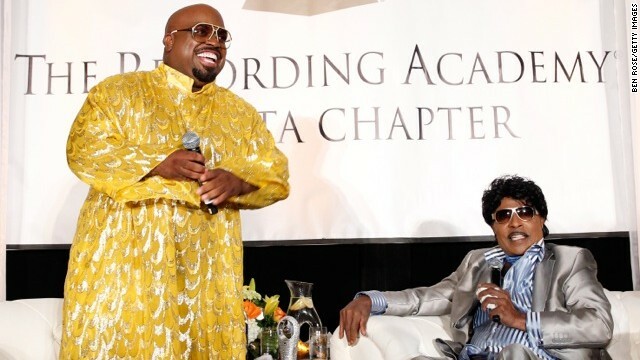 "I had a massive heart attack a week ago," Little Richard said. "They put a bed in my tour bus for me." The singer shared his memories of a young Mick Jagger sleeping on his floor, Jimi Hendrix playing guitar for him in his band and how he discovered James Brown as a young singer fresh out of jail near Atlanta. He also shared that he is a big country music fan, and a fan of Green's fellow judge on NBC's "The Voice," Shelton. "[Blake] was doing good, but now he's selling out [concert venues]," Little Richard said. He also had kind words for Green – who was dressed as flamboyantly as his idol. I kinda like some of Celo's music. I wonder who designs his clothes, Omar the tent maker? Whatever floats his boat, I guess.